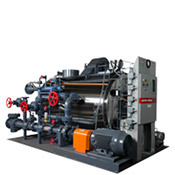 Vapor Power heaters are built marine tough for both ocean and inland water service. 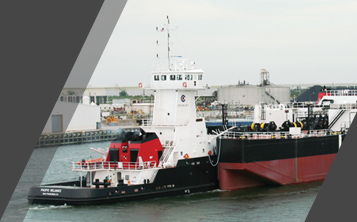 When it comes to marine applications, a closed loop thermal fluid heating system is ideal for cargo heating of heavy oils, asphalt, molten sulfur, or molasses. The stainless steel design is weatherproof for on-deck reliability on the inland waters. The compact design makes installation simpler and less costly for new construction and retrofit. Simple, non-proprietary controls and advanced heat exchanger design lead to the most efficient, user friendly heaters available. Heaters are available with ABS and/or US Coast Guard approvals. In addition to a quality product, Vapor Power has the most accurate sizing programs in the industry where we’ve NEVER undersized a heater. Our heat loss program will accurately size the thermal fluid heater so you don’t pay too much for your heater. The piping program will assist the shipyard or naval architect with calculating the amount of pipe coil in the cargo tanks. 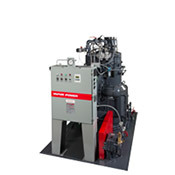 The Vapor Power Modulatic is a compact, vertical design with no fixed water level, making it ideal for steam applications in shipboard installations as an auxiliary boiler or process boiler. Like our heaters, Modulatics are ABS, US Coast Guard, or other approvals, such as Bureau Veritas or DNV.